"I follow my heart and its now telling me to become a dancer." The above info came from Constance, and was edited by yours truly (contact me). The image came from www.yu-gi-oh.co.uk. 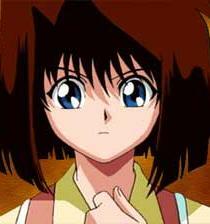 Téa is a childhood friend of Yugi. She cares a lot for her friends and tells them not to give up hope. She helps Yugi a lot too. She went out on a date with Yami Yugi (to help find out about his past), and fought Mai for starchips so that Yugi could get inside Pegasus Castle. Some fans believe that that Téa is the reincarnation of Teana, who lived in ancient Egypt with Pharaoh Atemu, but really this is never made mention of in the series at all. Téa's spirit does travel back in time with Yugi, Honda, and Jounouchi, but she is not a reincarnation. In Japanese, Anzu means "apricot". The above description came from Constance and Chibi, and was edited by yours truly (contact me). Then comes Yami no Yuugi and jumps the perv, while he knocks Anzu unconcious. Yami no Yuugi challenges him to a game of high card draw. Yami no Yuugi wins, but the perv retaliates. Yami no Yuugi then uses his Mind Crush ("Mind Crack" in Japan) and sends his evilness to the Shadow Realm. 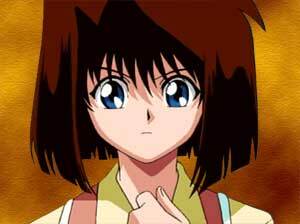 While Anzu was unconcious, she heard Yami no Yuugi's voice, and when she awoke, she found Yuugi. She's had a crush on him ever since he rescued her. She knows what she's doing, and she cares a lot for her friends. She'll never give up. Overall, Anzu is very kind and willing to help others.